Fleas are easy to catch, difficult to kill and multiply furiously. However, they don’t simply cause your pets to suffer from itchy bites, fleas can pose some serious health problems for your dog or cat as well. This is the most common pet health problem fleas can cause and affects dogs and cats of any age. Pets who are extremely sensitive or are allergic to flea bites will suffer from severe itching of the skin, which can lead to hair loss, skin lesions, and scabs on the skin. Infections can also occur if the scratching causes the skin to tear apart. If your pet swallows a flea—which is possible as they will likely be licking or chewing their skin to ease any itch—they may end up ingesting tapeworms as well. Tapeworms are parasites that live in fleas and can be passed on to your cat or dog. Living in the digestive tract of your pet, tapeworms will absorb vital nutrients that your cat or dog need, causing them to lose weight. Your pet will likely have a very itchy rear as well. 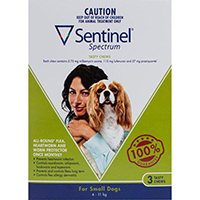 To get rid of tapeworms in your pet, use Sentinel Spectrum for dogs or Drontal for cats and dogs. Both products will treat and prevent intestinal worms—including tapeworms, and Sentinel Spectrum has the added benefit of killing adult fleas for a full month. Fleas can cause anemia due to blood loss, and this can be fatal in little puppies and kittens, as well as dogs and cats who are already weakened from other illnesses. Signs your pet is suffering from anemia include tiredness, decreased appetite and pale gums. You need to be extremely vigilant to ensure your pets do not suffer from the health problems fleas can cause. Most importantly, you need to quickly and effectively treat your pets for fleas at any hint of an infestation. There are different strategies depending on whether you are trying to get rid of fleas on dogs and puppies, or if you are trying to kill fleas on cats and kittens. However, in general, there are three types of flea treatment options available: oral and topical treatments, or collars. 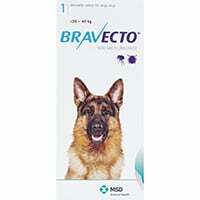 Use Bravecto as an oral flea treatment product for your dog (or Bravecto topical for your cat). 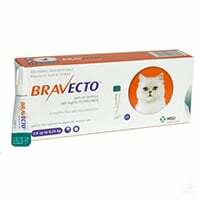 Both Bravecto chews and Bravecto topical kill fleas, eggs, and larvae, and provide up to 12 weeks of protection, preventing new infestations. 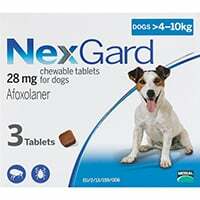 You can also use NexGard for dogs (and puppies as young as eight weeks), which offers your pet 30 days of protection from fleas. 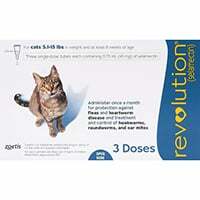 If your pet refuses chews, the topical treatment Revolution is good for both cats and dogs and will protect them from fleas for 30 days. 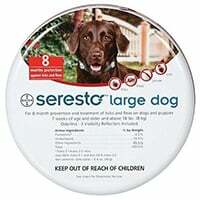 You can also use the Seresto flea collar on your pet as it not only kills fleas and their larvae, it also provides one of the safest and longest lasting flea protection (up to eight months). Bear in mind that in order to effectively get rid of a flea infestation, you have to kill the fleas in the house and yard at the same time as when you are treating your pet for fleas.